Matsuyama Junior College, which was established in 1952, is the only nighttime junior college of commerce in Shikoku. It has sent out more than 6,700 graduates. Under the educational system with a maximum capacity of 100 students, subjects in a wide variety are taught between 6 and 9:10 PM from Monday to Friday. These subjects include specializedones(i.e.business administration, economics,and law),computer-related subjects in the aim of acquiring Information Technology qualifications, and practical ones taught by licensed tax accountants and lawyers. With the change of the times, the number of working students is decreasing. Instead, the number of the students who are transferred to Matsuyama University and other universities is increasing. 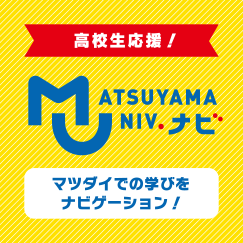 There is a system of admission by recommendation to each faculty of Matsuyama University as well. Matsuyama Junior College celebrated the 50th anniversary of the foundation in 2003. Matsuyama Junior College aims at a further leap with long-range prospects for the society in the 21st century kept in mind.